Today I have a couple of sample layouts for you using a few of the supplies from the August 'Lazy Days' monthly kit. I've pulled out three sheets of patterned paper from the Basic Grey 'Kneehighs' paper collection, two sheets of cardstock and the Basic Grey alphabet sticker sheet. I've kept my first layout quite simple. I may be biased but I do think he is very cute! I want to handwrite in some journaling but I'm trying to choose a story to tell about him, there was nothing spectacular about the day the photo was taken so I think I'll write about the characteristics he's displaying already: lots of room for journaling on this layout. My second layout has a bit more going on. 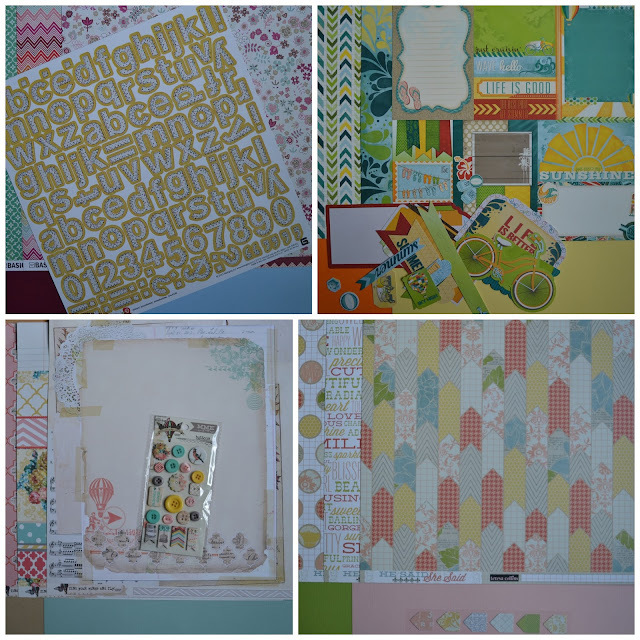 I particularly loved the multicoloured chevron print so I wanted that as my background and I just layered a few other pieces of patterned paper up together with a couple of photos and another title using the alphabet stickers in the kit. Here is Kirei's layout using the same supplies. For more details on how she made it, check out her blog. and what's more, if you sign up for a monthly subscription during the month of August you can have this kit for the promotional price of just £20 (usually £25) and your postage is absolutely free. Just click the Paypal button below.